Vrinda Quintero works as a caterer, but she’s really a bridge builder — a social engineer if you will. Food for her becomes a way to connect people, promote conversations and storytelling, to perhaps see one another in a new light. She experienced that joy in her native Venezuela … once, before greed and poor governance catapulted a once-prosperous and thriving country into economic, political and social ruin. Quintero remembers cooking, eating and sharing with her family in Caracas, her birthplace. She keeps those moments alive within her acute senses, still hearing the laughter, and smelling griddled arepas, the daily bread of Venezuela. Made from white cornmeal, water and salt, the arepa dough is formed into a round disk, cooked, split open and stuffed with a variety of savory ingredients. 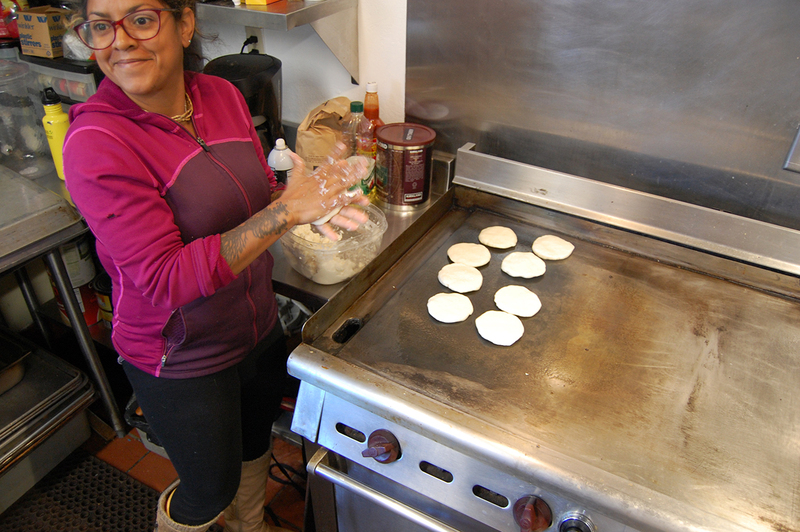 A strong symbol for who she is and what she stands for, the arepa would one day become her calling card. Quintero loves poetry. She’s most drawn to Oliver, the Pulitzer Prize-winning American poet who died in January, because everywhere in her verse one finds threads of connectivity. Always inspired and blessed with boundless energy, Quintero spends her days simmering with compassion for others. The 27-year-old substance use disorder counselor at Encompass Community Services in Aptos met Quintero while they worked together at the nonprofit Homeless Services Center, a work-experience program in Santa Cruz. Quintero spent three years at the HSC, and through her job met volunteers running the Downtown Streets Team. DST is made up of volunteers who are homeless or at risk of becoming homeless. They work collaboratively on beautification projects, ultimately trusted to complete tasks and become productive, cooperative team members. In return, they receive a non-cash stipend to help cover basic needs, while taking advantage of case management and employment services to find housing and employment. What’s more, team members perform peer-to-peer outreach to other local men and women experiencing homelessness. “I found that amazing,” Quintero said. So she started serving meals at DST functions, and each Thursday she cooks for regular team meetings. One day she met a woman who wanted to own her own business. “I started helping her with kitchen work, sanitation, cleanliness, permits,” Quintero said. That led to an idea for a full-scale culinary program where Quintero could empower and train others to cook for themselves, or use those skills in the job market. 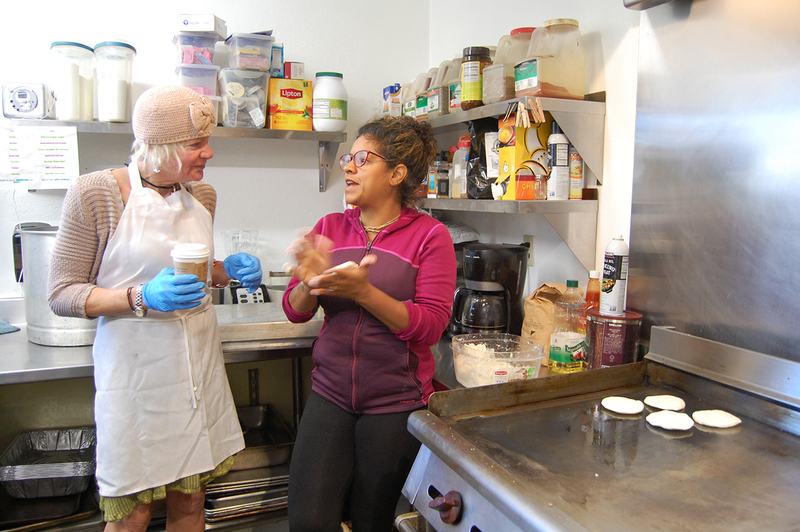 “The kitchen is a very healing and empowering place,” Quintero said. The DST reached out to the Salvation Army of Santa Cruz, who now provides the use of its kitchen at the facility on Laurel Street. Each day Quintero wakes up thinking about her father, her aunt and other family still suffering in Venezuela. But she swallows that worry, and goes to work each day helping others. Always with a smile. She hopes one day to bring her family to Santa Cruz. She actually studied international affairs in Venezuela. When she finally settled in Santa Cruz she wondered how to best apply her skills. She worked for a time at the Economic Justice Alliance of Santa Cruz County, and then Homeless Services Center. Her earlier travels took her around the world, to India, China and beyond. In mid-April she will unite Downtown Streets Team with the Coastal Watershed Council for an afternoon of food and storytelling along the San Lorenzo River near the duck pond. Five storytellers will be picked at random and given five minutes to tell a story. Anyone can enter, everyone is welcome. It’s free, of course. Areperia 831 will cook, of course. The theme is bridges, of course. Participants share stories of connections, crossing rivers, overcoming differences, whatever inspiration they can share around that theme. Just bring a blanket to sit on. Her work has finally been widely recognized, and not through a modern world’s look-at-me self-marketing strategy. She’s too humble for that. Quintero and her work drew attention on March 22 when Event Santa Cruz honored her and others at the 10th annual NEXTie awards at Rio Theatre. There were 2,500 nominations, resulting in 18 community honorees, including Vrinda Quintero named as Foodie of the Year. Foodie of the Year? Audience members rose, they applauded heartily, but after hearing her introduction some had to have been a bit confused. She’s so much more than a foodie. It all boils down to leadership. And that’s how bridges get built. Salinas native Mike Hale is a freelance writer who shares his time between the Monterey Peninsula and the coast of Cornwall in southeast England.